So you've purchased yourself a fancy new stand up office desk to reduce the risks associated with sitting for long periods at a time. Now what? You need to focus on forming the good operating habits needed to get the most out of your investment. Today we'll teach you how to work healthy at your stand up desk with helpful tips and strategies. Enjoy! Much like working a traditional office desk, you need to avoid hunching over to type at your stand up workstation. This bad habit puts unnecessary strain on your back and spine. 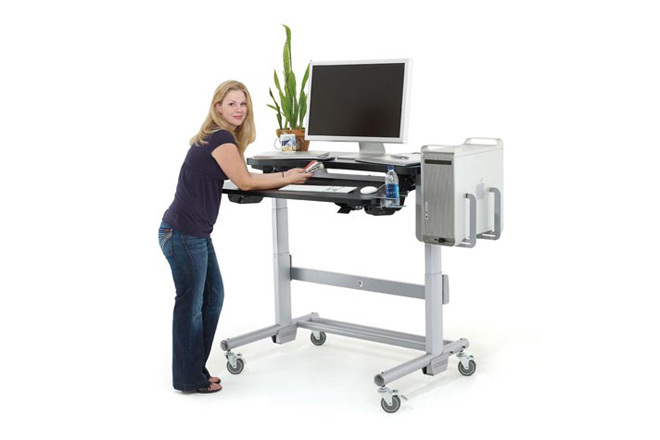 When using your stand up office desk you'll want to maintain good posture. Stand up straight and avoid leaning over onto the operating surface at all costs. 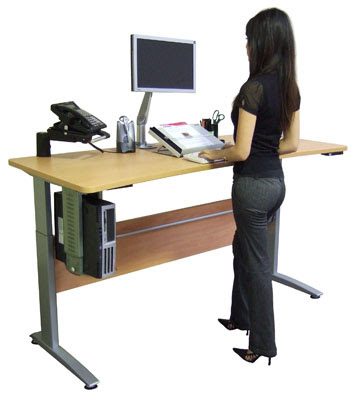 This way, blood flow isn't restricted and you can fight fatigue and back pain the way the stand up desk was intended to. If you've set your monitor on top of your stand up desk surface, the odds are you're looking down when computing. This causes neck strain that can be effectively avoided by getting your screen up to eye level. A stack of books or even a shoebox will do the trick if you're looking to avoid further spending. That being said, the professional solution is an attachable monitor mount that adjusts to ensure your screens are at the correct and healthy operating height. Before a weeding, you'll hear people tell the groom to avoid locking his knees during the ceremony. This common habit causes muscles stiffen up, then fatigue sets in, and funny out take videos get taken when he passes out at the alter. While you probably won't pass out at your stand up desk from locking you knees, blood flow will be restricted and fatigue will be ready, willing, and able to strike. The full weight of your body will be on your knees and that's not good! Instead, you'll want to work healthy and smart by keeping a little bend in your knees while using your stand up station. With a stand up desk, operating space is probably going to be a bit limited. 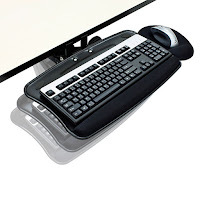 You don't want to sit your keyboard tray atop the desk surface as you'll be computing at unhealthy angles and taking up a ton of space that can be otherwise saved with an under-mount keyboard tray. Articulating keyboard trays that attach underneath desk surfaces will encourage healthy computing angles while reducing the risk of workplace epidemics like Carpal Tunnel Syndrome. 5.) Stretch, Hydrate, and Move! This tip is a 3-parter. 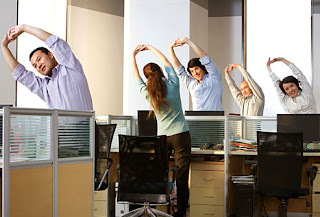 First and foremost, you'll want to stretch before and after using your stand up office desk to stay loose. Regardless of what type of desk you use, you need to hydrate regularly throughout the day to fight fatigue. Lastly, you've gotta move. 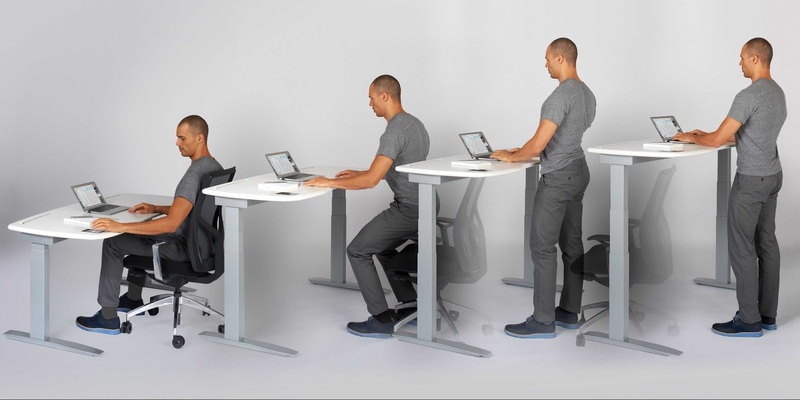 Stand up office desks are all about encouraging continuous movement in the workplace. 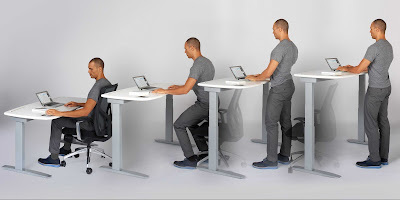 If you're just going to stand still, there's really not much difference in just using a good ergonomic office chair throughout the day and saving the money spent on a stand up desk. Move around while working at your standing height desk to keep the blood flowing. It's how you fight back against cramping, fatigue, stress, and even pain. Last but not least, you need to take a seat every one in a while. In the long run, who wants to stand on their feet and from 9 to 5 when there's a perfectly good office chair sitting next to you? Stand up operating is great as an alternative to extended sitting sessions. However, you need a good mix of both. 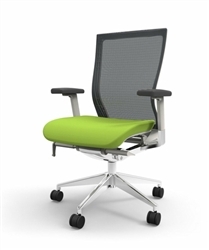 Consider using your stand up desk and ergonomic task chair in 1 hour intervals. Stretch and hydrate a bit before each switch and you'll be on the road to success. Remember, it's all about continuous movement and good blood flow. If you have trouble remembering to make the switch, use a timer. After about a week, you'll likely be alternating between sitting and standing before it even goes off. Stand up desks and good office chairs should be used in harmony to keep you at peak performance levels. Never strop striving to learn how to get the most out of both!